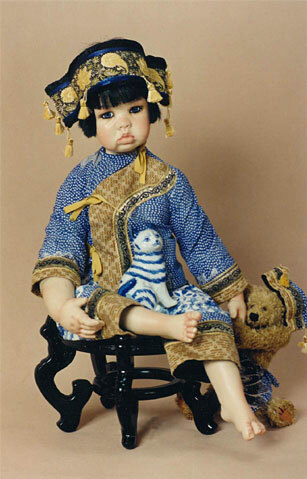 Pouty, Chinese baby dressed in a richly detailed, traditional blue and white tunic and pants. She wears a stunning headdress and sits atop a black lacquer Chinese stand. She is holding a blue and white porcelain cat and a cheeky soft teddy.